I have a penchant for baking recipes that utilize buttermilk. I find it adds a really nice tangy richness to things like muffins and scones. And truth be told – I kinda like the taste of buttermilk straight, although I don’t think I could drink a whole glass. Of course, recipes only call for 1 cup or less usually, and the smallest carton I can buy is 500mL. As such, I often find myself with a partial container of buttermilk in the fridge after baking something, and more times than not it gets forgotten and thrown out. This situation arose again when I made those kale, pumpkin, and cheddar scones, but this time I was determined to not waste that tasty tangy milk, so I put my thinking cap on and came up with the perfect solution – a smoothie! I still have that buttermilk in the fridge. I’m sure I could use that – you can put anything in a smoothie. Lots of bananas on the counter – I’ll use those too. I’ve made banana bread with buttermilk before, I need something to make it “bready”. How about cereal? I’ll just add a few other ingredients to make it interesting. Should be good. 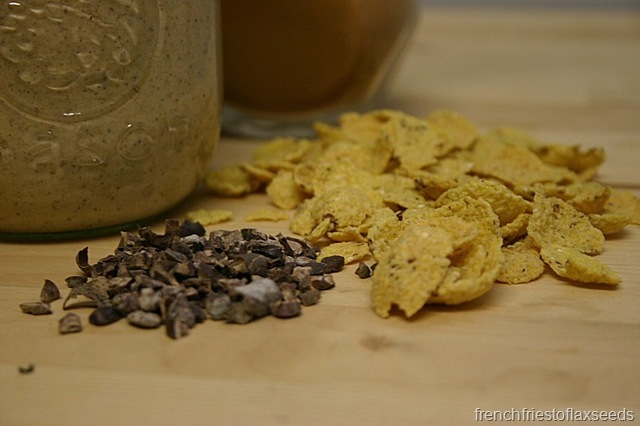 The cereal inspiration was from something I tried ages ago – using a flaky cold cereal in a smoothie a la Chocolate Covered Katie. It gives your smoothie some heft. I jazzed up the smoothie with some cacao nibs, cinnamon, and cashew butter. It really did taste like a creamy, cool, drinkable version of banana bread. And now I think buttermilk will be on my regular grocery list. 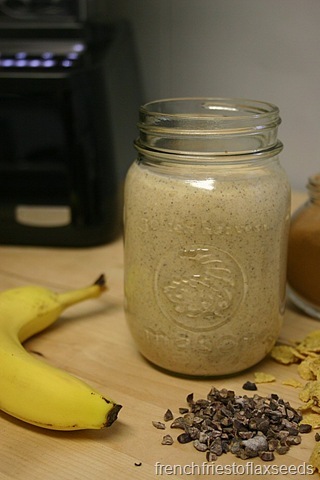 A quick breakfast smoothie that tastes like banana bread and makes use of that half empty carton of buttermilk leftover from your last baking project. 1. Put all your ingredients in your favourite blending machine. Whiz away until you have a smooth, creamy treat. Enjoy! 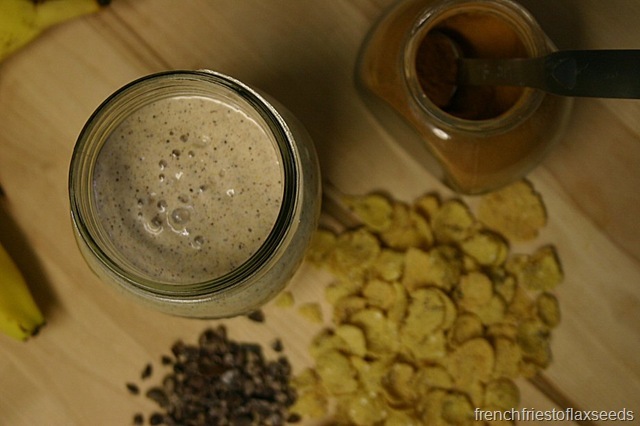 Note: Feel free to use your favourite cereal and nut butter when making this smoothie. I like Nature’s Path Mesa Sunrise, and it’s gluten-free to boot! What’s your favourite way to use buttermilk in the kitchen? Buttermilk in a smothie? Now that sounds unique… in a very good way. And buttermilk + cereal just makes it that much better. I rarely have buttermilk around unless I need it for muffins or something. Next time though, I know what I’m trying out with the leftovers! I like to pourit all over my naked body. JK! I actually don’t buy buttermilk, I just add vinegar to regular milk – I am cheap like that! 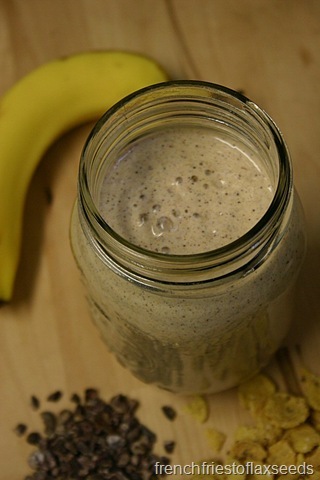 But that being said, I think I need to try your banan bread smoothie! 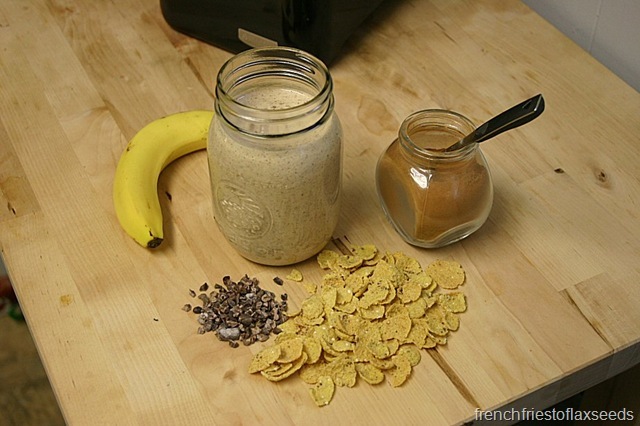 hmmm interesting buttermilk and cereal in a smoothie! I may have to give it a go.